For the most part, water heaters are fairly self-sufficient, and you can rely on your to warm water for showering, washing clothes, washing dishes, etc. However, it’s still a good idea to keep up with some basic maintenance. 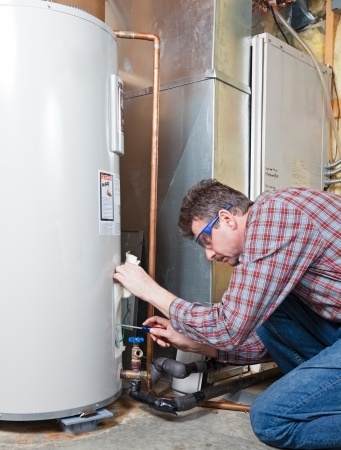 In fact, properly maintaining your water heater now could save you a lot of money later. Here are just a few of the ways that water heater maintenance could save you money. When you’re not having problems with your water heater, you probably don’t give it a whole lot of thought, and you may be hesitant to spend money on it. Whether you have a tankless water heater or a traditional water heater with a storage tank, here are a couple reasons why you should consider spending a bit to keep up with routine water heater maintenance. Extended lifespan. Water heaters may not be built to last forever, but keeping up with basic maintenance helps to ensure that they reach their maximum age before needing to be replaced. If you completely ignore your water heater, you’re more likely to face a premature breakdown. Prevent costly repairs. In addition to ensuring that you’ll be able to keep your water heater as long as possible, keeping up with maintenance generally means facing less costly repair bills. Maintenance keeps your system running perfectly and provides an opportunity for an expert to fix minor problems before they turn into bigger ones. Improve efficiency. As water heaters age, they tend to become less efficient. Since they’re already one of the biggest energy hogs in your house, it’s a good idea to keep up with routine maintenance to keep yours as efficient as possible. Basic maintenance could drastically lower your energy bills. When you need water heater maintenance in Poughkeepsie or the surrounding areas, contact the experts at T.Webber Plumbing, Heating, Air & Electric. To schedule service, please call (845) 288-2777.